Founded in 1896, the South Carolina Confederate Relic Room and Military Museum is the third oldest museum in the state. The museum focuses on South Carolina’s military history from the Revolutionary War to the present. Originally housed in the SC State House, the museum relocated to the War Memorial Building adjacent to the University of South Carolina in the mid-twentieth century. In 1998, it became an agency of the South Carolina Budget and Control Board and in 2002, moved to the Columbia Mills Building. The museum expanded in 2007, converting the old mill’s former cistern into a new gallery that showcases special, large-scale exhibitions. Visitors to the museum can explore South Carolina’s distinguished martial tradition in exhibits covering the Revolutionary War, Mexican War, Civil War, Spanish-American War, World War I, World War II, the War on Terror, and other American conflicts. A recent addition to the gallery is an exhibit featuring artifacts from the museum’s award-winning Write from the Front program. This program collects emails, photographs, and objects from South Carolinians serving in the current War on Terror. The museum houses an expanding archival collection available to researchers by appointment. Archival strengths are the financial papers of Confederate purchasing agent Colin J. McRae, materials from South Carolinians who served in the Spanish-American War, images of South Carolina troops stationed on the Mexican Border in 1916, and the collection of the crew of the WWII light cruiser, the USS Columbia CL-56. The South Carolina Confederate Relic Room and Military Museum serves as the State’s military history museum by collecting, preserving, and exhibiting South Carolina’s military material culture from the colonial era to the present, and by providing superior educational experiences and programming. 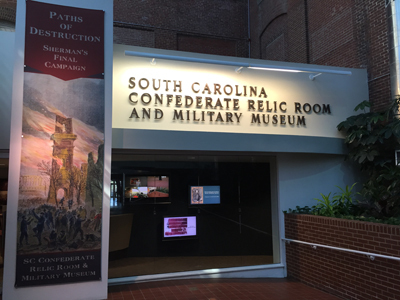 The South Carolina Confederate Relic Room and Military Museum offers a unique opportunity to discover and explore the state’s military history through informative and award-winning exhibits, featuring many rare and one-of-a-kind artifacts. The museum’s evolving permanent exhibits and changing exhibit galleries make each visit a new experience! The Museum's Education Room is a great space for your business or group to meet. The rental fee includes a screen and projector, podium, and AV equipment. Tables and chairs can be arranged theater, classroom, or banquet style to best suit your needs. The fee also includes admission to the Museum gallery for all of your attendees. The Museum gallery space and conference room is also available for rental. If you would like to reserve the room, please complete the Rental Agreement (PDF) form and fax it to 803-737-8099. A fee schedule and rules and regulations are included in the Rental Agreement. Please contact Shirley Schoonover at 803-737-8093 or sschoon@crr.sc.gov with any questions regarding rentals.